Who Makes the Best Batting Tee? How to Choose a Batting Tee? Is the Tanner Tee the Best? How to choose a batting tee? Batting tees are a necessary tool for all baseball players. The batting tee is an excellent tool for the beginner to better their skills. It is merely the best tool for working on the mechanics of your swing. Hitting tees are one area where you don’t always get what you pay. It appears that for such a simplistic piece of equipment, any baseball batting tee would work. Nonetheless, that is not the case. Tanner Tee is our pick! I have the Tanner Tee and I have used it for a few years now without having any troubles with it. I feel comfortable recommending the Tanner Tee. The durability and its portability make it a good investment. The resale on the Tanner Tees is high with a good return on from your original costs. What Should I Look For and How to Choose a Batting Tee? Durability: you will want a tee that can withstand the wears and tears of many seasons. Portability: find something that is lightweight enough that it can be moved easily. Adjustability: look for something that you can raise and lower easily. Some baseball batting tees are made from steel, plastic, rubber, or a combination of the three. Some batting tees will use a combination of materials which will usually be soft rubber towards the top and heavier metal at the bottom for added stability. Ideally, you want to find durable materials which will not break. This goes without saying, but if the top rubber part of the tee is ruined make sure to replace it as soon as possible. Even advanced players that don’t often miss the ball when they practice on the tee, need materials which will not crack easily. We don’t want your athlete swinging a $300 dollar bat at a batting tee that could do damage to the bat. There are many features or materials which can influence the quality of batting tees. Unfortunately, some of them can have a negative impact on your playing experience and even worse, they can ruin your bats. Your baseball batting tee needs to be adjustable. It should have no problem adjusting heights and should handle anything between 20 inches up to 40 inches. But adjustability doesn’t only refer to height. It may also refer to the base of the tee which can come with multiple positions to adjust the position of the pole. This is good for working on pitches that cross the plate on the corners. It helps you to work on hitting the ball the other way or learning to keep your hands tight and pull the ball. If you`re going to transport your baseball batting tees you need to make sure you have enough space in your vehicle for storage. The adjustability should also allow for a product which is solid enough to provide a good platform but which can be disassembled to fit into an equipment bag. Like I mentioned above. The tees can be made from a different material but there are many materials to choose from. Some baseball batting tees are made from steel or plastic while others remade from rubber. You may so find some products which use a combination of materials which can usually be softer on top and heavier at the bottom for added stability. Ideally, you want to find durable materials which will not break. Even advanced players need materials which will not crack easily. One tip is to look or rubber designs, especially towards the top end. Rubber is durable as it doesn`t crack and it also doesn`t affect your bat as much as plastic. If you decide to purchase one of the more expensive tees you should remember you are making an investment and you should look for longer warranties to cover your chosen product. You may also want to check if your warranty covers the use for multiple users or commercial use in case you need it. Some manufacturers will not replace the product should you have multiple players using it. Hitting a baseball with a bat isn’t as easy as it may look. When batting, the intent is to swing on a level plane that is supposed to be parallel to the ground, which will induce line drives and consistency in creating solid contact with the ball. Whether you’re playing baseball or softball, batting tees are the perfect training device for hitters of all skill and age levels. From young to old, beginner to professional, hitting tees helps improve accuracy, control and overall swing. A level swing keeps the bat in the hitting zone for a more extended period and will lead to more base hits and fewer strikeouts. You can adjust your stance and swing approach, which allows you to work on your weaknesses while improving your overall game. Batting tees are great for allowing you to focus on your swing. I know players that like to go by off by themselves and just hit balls off the tee. Not only do they find it helpful with perfecting their swing, but also relaxing. They can zone out everything else around them. Portability isn’t an issue with most tees. Today’s tees are pretty portable. They all have the same features with a few minor differences. The build in quality is the difference. Most tees feature tripods, flexible tubes, carrying bags and more, so you can comfortably fit them in a bag, and when you need it, the tee will be ready. One thing that is nice about the tee is that you don’t need a partner to use it. You get more reps in when there are two people, but one will do just fine. A tee will always be available day or night, hot or cold. You will learn that one device you will be able to rely on as you grow will be your batting tee. Practicing on your own time allows you the freedom and opportunity to perfect your swing through repetition. For easy ball retrieval, consider purchasing a net to hit the ball in. We have a review for you to read if that is something you would like to add to your practice gear. We also have a section on screens and rebounders. Tee work is something that you can do with your coach. Right now I practice with a few different guys during the week, and the majority of their swings right now are from the batting tee. I sometimes take video of them, so they know what I am talking about when I show them their mistakes. We take a close look at their technique when hitting the ball. I find it’s better to show the players mistakes through video then trying to explain. Players usually don’t feel like they are doing something out of the ordinary, but when they see it, well it’s a different story. It also speeds up the process of correcting whatever may need adjusting. Hitting baseballs off the tee will help you get used to that new bat, it’s size, weight, length, balance, and material. Tee work can be a helpful warmup before practicing with a coach or machine. Using a batting tee in your batting practice session is a tried and true way to help improve your hitting mechanics. When live pitching comes in, however, the ball’s not going to be set in the same spot every time, which is why mixing up your tee work throughout your training can be helpful in mastering swings for the entire strike zone. The tee is one of the best ways to hone your swing as a hitter. Sometimes there is a stigma from t-ball that says you should outgrow it, but that’s not the case. 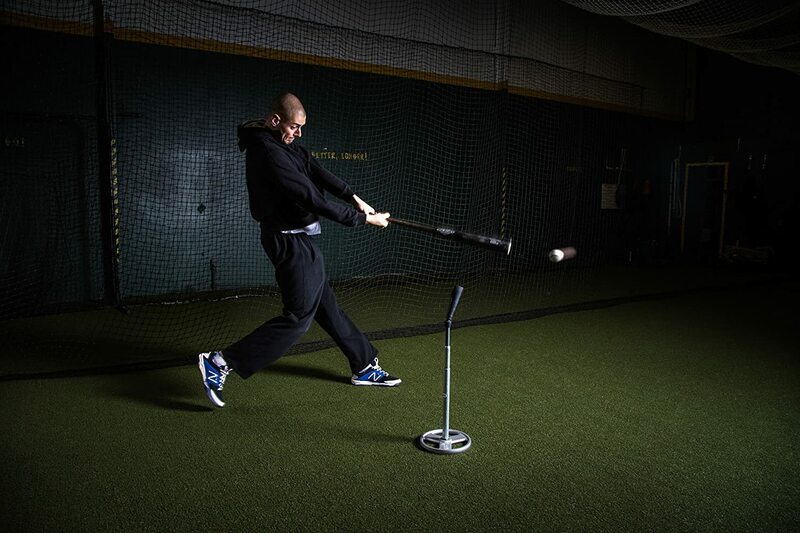 Big league hitters work off the tee regularly to keep their mechanics clean and crisp. One thing to remember in order to reap the benefits off of the tee is placement. To start, get into your stance in the same place you would in the game in relation to home plate. Once set, you can then position the tee in the right spot for where you would make contact with the pitch. For pitches down the middle, you should put the tee in front of the plate and just off where your stride foot will land. You should be able to hit it back up the middle between the right-and left-center field gaps. If you position the tee in the wrong place, you can create bad habits. So, you can either change your swing to make good contact or take your normal swing and not hit the ball on the barrel. For an inside pitch, you want to hit it farther out in front of home plate. The tee should be on the inner half of the plate and 6″-12″ in front of home plate or where your front stride foot will land when taking your swing. This is where you want to make contact in order to hit the ball hard and keep it in fair territory. For an outside pitch, put the tee on the outer part of the plate, and even with your belt buckle or belly button. By letting the ball travel deeper in the zone, you can take your normal stride and swing to make good contact and drive the ball to the opposite field. One drill you can work on with the tee is to simulate your eyes tracking the pitch. Get in your normal stance and act as though you are looking out at the pitcher. Let your eyes travel as if they are following the pitch in, and then lock onto the ball as you complete the swing and make contact off the tee. This is a great way to help fine-tune your swing and work on making it a consistent motion. 1 Who Makes the Best Batting Tee? 2 How to Choose a Batting Tee? 3 Is the Tanner Tee the Best? 6 What Should I Look For and How to Choose a Batting Tee?